You can't miss the mural on the far wall of Hardwick's Galaxy Bookshop. As the moon rises on a snowy evening, animals cavort, constellations sparkle and smiling people move boxes from one building to another. 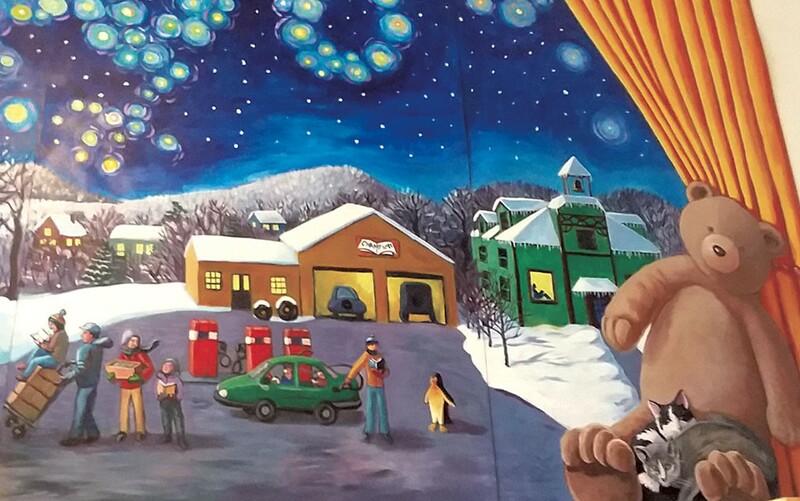 Created by local artist Tara Goreau, the scene depicts a key event in the store's history, one that offers a glimpse of local values. On Martin Luther King Day in 2009, 80 community members braved temperatures in the negative teens to relocate the Galaxy — every book, shelf and cranny — from the old Merchants Bank building to 41 Main Street. For Galaxy founder and owner Linda Ramsdell, the move to a more visible, slightly smaller space was a shrewd response to industry shifts that have imperiled independent stores across the country. 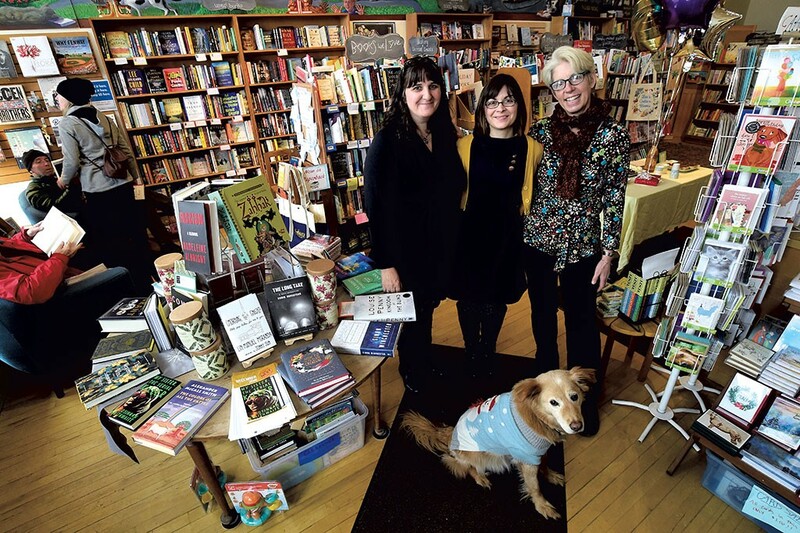 Residents of Hardwick and 10 neighboring towns flexed their collective muscle to demonstrate their commitment to the bookshop as a cultural and social hub. "It is an important part of why people come to Hardwick," Ross Connelly said of the Galaxy on a recent shopping trip there. A devoted local patron and reliable book mover, Connelly owned the Hardwick Gazette from 1986 through early 2017. "I very much value and go out of my way to support local businesses," noted Connelly's son, Sawyer, also there to shop. He grew up frequenting the bookshop and still supports it from his home in Montana. He said his experiences at the Galaxy were central to "understanding the role that local businesses play and knowing the people that we are supporting." Hardwick has weathered its share of unpredictable economics. In the 1800s through the early 1900s, the granite industry and agriculture fueled growth there and in surrounding towns. The Hardwick and Woodbury railroad made the area a commercial center. But the granite industry's decline through the 1930s destabilized the local economy, which didn't begin to recover until the past two decades. Some attribute that recovery to agriculture- and food-related businesses, such as the Cellars at Jasper Hill in nearby Greensboro Bend, and organizations, such as the Center for an Agricultural Economy. Others attribute it to cooperative projects, such as the now-closed community-supported Claire's Restaurant and Bar, and to local agreement on the value of community resources, such as the Jeudevine Memorial Library and the Galaxy. One thing's for sure. "Hardwick was not like this when I was a kid," said Rachel Sharp, a published author who grew up visiting her grandparents in the hardscrabble town on the Lamoille River. She recently moved from New York City to become the bookshop's newest staff member. Back then "there was no Scale House," she said of Hardwick's newest, über-popular eatery. "It's nice to come back and see it doing this well." Whatever the reason for the change in the town's fortunes, locals are devoted to their bookshop and have had a large hand in shaping it. A carefully arranged maze of shelves in the 700-square-foot retail space holds about 3,500 titles organized into approximately 30 sections. There are books on history, science, poetry and travel, as well as books by Vermont authors, picture books, used books and self-published works. Using every inch strategically, the shop also sells sundries such as note cards, toys, memorabilia and children's clothing. Among the Galaxy's most endearing elements are its quirks: the three canvas boards signed by every author who has given a talk or book signing since 2009; the Suggest a Book spot outfitted with tacks and paper so patrons can post recommendations; and Boo, the only canine staff member. "He's here most days that I'm at work, and he has quite a dedicated fan base," said Galaxy co-owner Andrea Jones, Boo's person. "We had to put a sign in the window saying when he's here and when he's not, because a lot of people came in looking for him and would get upset if he wasn't here." The bookshop offers two to five public events per month, such as author readings, a book club and children's activities. But Galaxy co-owners Jones and Sandy Scott said the store also offers something less obvious: a third public space beyond home and school or work. "Every day I see people come in and connect with neighbors or strangers who are looking at the same books," said Scott. Offering a communal meeting place is "a really important role that independent bookstores play." Fresh out of college, Craftsbury native Ramsdell founded the Galaxy in 1988. An avid reader, she took on the challenge after a friend suggested that Hardwick needed a bookshop. Ramsdell started the business small and grew it gradually, paying careful attention to what patrons wanted the shop to carry. At each business juncture, she gauged local interest and made changes accordingly. "I think of myself less like a born entrepreneur and more as someone who has always loved to read and loved books," said Ramsdell, seated below the mural. "I wanted to make that world available to other people." She learned the requisite business skills "along the way and by the seat of my pants." Among the challenges Ramsdell had to face were those of the digital era. The advent of high-speed internet in the Hardwick area in the 2000s came with a noticeable shift in sales, she said. When some once-regular customers stopped coming, Ramsdell condensed inventory and reduced overhead costs by moving from the bank building to Main Street. Her new strategic location, across from Claire's and between the Whistle Emporium and the Buffalo Mountain Food Co-op and Café, "made a big difference," she said. Ramsdell was "open and honest" with customers about how much she appreciated their business, she said. "And our side of that bargain was to make it a place where people wanted to come." She also invited people to think about what they wanted "their town and their streetscape or retail landscape to look like in the long term. When you forgot you were going to a birthday party, do you want to be able to run to the bookstore and pick up the perfect gift? You can't do that 20 minutes before the party on Amazon," she said. By 2014, Ramsdell was ready to explore new ventures, so she sold the bookshop to Scott and Jones. Scott has worked full time as a Galaxy bookseller and events coordinator since leaving college. "It was kind of my dream job," said the Walden native. Jones, also from Walden, brought experience teaching English at Hazen Union High School and working at AWARE Domestic & Sexual Violence Services. She's always loved the bookshop, she said, and wanted to be part of its future. Scott and Jones have carried the Galaxy torch in style. They maintain a membership program, collaborate regularly with local businesses on events and "give thousands a year in donations to local organizations," said Jones, "through supporting raffles for nonprofits, buying ads in the high school yearbook and giving prizes for Green Up Day. We say yes to any group that comes through the door." On Saturday, patrons streamed into the bookshop to celebrate its 30th anniversary. In just an hour and a half of the daylong fête, about 25 people came through. Sparkling cider, elegant confections and balloons fostered conversations and transactions. Some customers brought 25-year-old Galaxy tote bags, hand-painted bookmarks, T-shirts and photos for a chance to reminisce and receive a special shop coupon. Others chuckled and teared up as they watched the video that Jones' college-age daughter Natalie had created for the event. "I feel so fortunate that Andrea and Sandy are continuing the bookstore," said Ramsdell. "People ask me if I miss it, and sometimes I do. But I am so happy that I can visit and enjoy all the parts of it that I always loved." Her favorite activities: opening a box of new books, perusing advance reader copies and seeing the arrangement on the front table. By the shop's entrance, that table currently displays Michelle Obama's memoir Becoming and Madeleine Albright's Fascism: A Warning, alongside Madeleine Kunin's Coming of Age and Erin McCormick's Classic Diners of Vermont. Just past it, handwritten note cards give detailed information on staff-selected books. "One of our favorite sections is the staff-picks shelf," said Scott. "It's a pretty good reflection of our staff and our store and what we have to offer." Scott and Jones keep tabs on patrons' interests with the help of six part-time staffers. Between them, they read every book the store carries so that they can offer a diversity of knowledge, said Jones: "Each staff person brings in a different aspect of the community. "I feel really proud of what we've done here," Jones continued. "But even bigger than that, I feel proud to be part of the Galaxy, because it is so much bigger than this location or this shop or these owners. The Galaxy is part of the fabric of this town, and we are all woven in." The original print version of this article was headlined "A Galaxy Close, Close to Home..."